Wow, it is almost Wednesday already? Since the beginning of November, my little girl started taking piano lessons on Monday evenings, which means we would grab something fast for dinner, or I would cook something in the crock-pot so dinner time is not so rushed. Tuesday nights I would try to cook something hubby and little girl really enjoy so the family can have a more “homey” meal. If you follow Weeknite Meal’s FaceBook page (https://www.facebook.com/weeknitemeals), you would know my lovely neighbor brought over a bunch of HUGE lemons last week. I have always been a fan of smaller lemons with thin peels, they just seem juicier and easier to work with. So when these GIANT ones came along, my initial reaction was “Oh I bet they are going to be all dry inside, and the thick skin would make them hard to work with…” Boy was I wrong! Each lemon yield about 1/3 cup of juice, and they are so easy to squeeze! Little girl and I made frozen lemonade, regular lemonade, and for tonight’s dinner, I decided to try my hand at Asian Style Lemon Fish. The dish turned out very delicious if I may say so, little girl told me she loves it equally as much as the Sweet and Sour fish fillet (https://weeknitemeals.wordpress.com/2011/08/18/sweet-and-sour-fried-fish-fillets/). Hope you will give it a try also! Boil water, sugar, lemon juice, chicken powder, turmeric together, once boiling, turn down the heat to simmer, add flour mixture, garlic, green onions and ginger, simmer for 15 minutes. Mix flour, salt and pepper in a plastic bag, toss the fish fillets in, close the bag well and toss around to cover the fish. Pre-heat some oil in a skillet, pan-fry fish over medium heat until they’re done (around 4-5 minutes per side). Bring the fillets out and drain oil onto paper towel if your prefer. Mix corn starch into sauce mixture, stir until thickens. 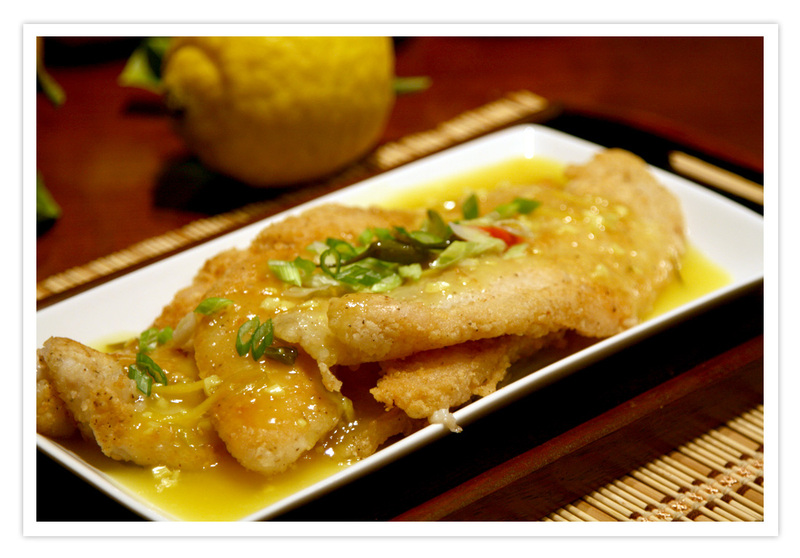 Drizzle sauce over the pan fried fish fillets, serve with rice. Thank you Nami! I was not too sure of the sauce first, because we don’t normally eat citrus flavored dishes, but with all these big lemons laying around, I wanted to make sure to make good use of them, so my neighbor’s hard work wouldn’t go wasted. The tree is actually not hers, there’s a Filipino family down the road with all kinds of fruit trees in their yard, so my friendly lady neighbor rang the door bell and asked whether she could have some lemons, the gentleman who planted the trees said sure! Jeno, this is such a welcome, beautiful, sunny meal when days get shorter and darker. It looks like a tangy dish which wakes one up from the Autumn lethargy. I have to remember to try it one day! You are so lucky to have such a generous neighbour! The lemonade makes me think a splash of vodka would be a perfect pairing 😉 (Maybe not for your daughter though). 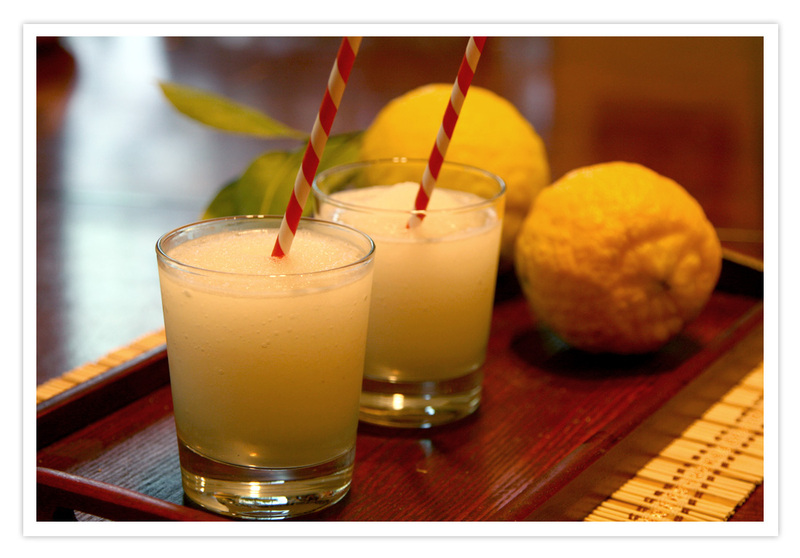 The frozen lemonade would surely go great with some adult ingredients, great idea! Thank you Lyn! Yes this particular neighbor friend is always giving me wonderful food items! She’s an excellent cook, also super thrifty. My favorite thing to eat is her purple yam pie, just thinking about it makes my mouth water! I was a bit worried about my little girl not liking the citrisy taste of the fish, but the rest of the ingredients really balanced the flavor out. Let me know how you like it if you ever make it! Yes Kath, the lemons are definitely unbelievably juicy! Aww, your Dad sounds like a great cook just like you, it’s good to know looking at my photos actually brought you some good memories!